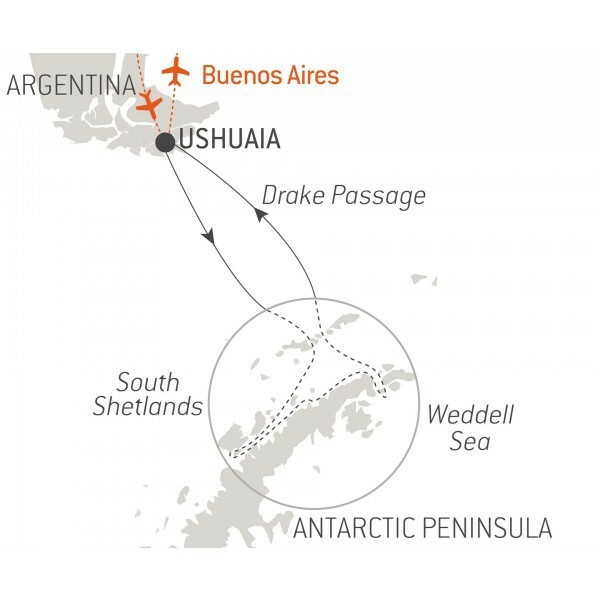 PLEASE NOTE: For your comfort, your cruise package includes an overnight in Buenos Aires the day before embarkation and the flights to/from Ushuaia. Disembarkation. Charter flight Ushuaia to Buenos Aires. Named after talented photographer Paul Pléneau, who accompanied Jean-Baptiste Charcot on his 1903 expedition, Pleneau Island has become a refuge for gentoo penguins, elephant seals and fur seals. A ‘fleet’ of imposing ice formations sit like anchored ships along its shores. Like works of art, these unusually-sculpted icebergs range in colour from white to blue and every shade in between. On land, red algae provides a striking contrast against empty swathes of snow that alternate with gentoo penguin nesting sites, strewn all across the island. This cove, a natural harbour located in Salpêtrière Bay, was discovered by French explorer Jean-Baptiste Charcot. Named for the explorer's father, famed neurologist Jean-Martin Charcot, this tip of Booth Island still holds vestiges of Charcot's 1903-1905 anchoring aboard his ship, Le Français. A brisk walk through the snow will take you to the remains of Charcot's stone cabin where he conducted studies on magnetism. Right nearby, you'll notice a colony of gentoo penguins. If you continue on to the summit, you'll pass by the remnants of a cairn and enjoy an unobstructed view of the vast field of icebergs scattered over the bay like white tombstones—an eerie, mystical site like none other. A little corner of paradise in the shadow of a towering glacier, Neko Harbour is without a doubt one of the most beautiful sites on the Antarctic Peninsula. It was discovered by Belgian navigator Adrien de Gerlache during his 1897-1899 expedition. Mountains, ice and wildlife combine to form a truly unique landscape. Animals are as abundant as they are exotic: among others, you'll encounter seabirds (gulls, Cape petrels, cormorants) and marine mammals (seals, orcas and other whale species). Head out on a Zodiac® excursion to get up close to the icebergs, stop over near a penguin colony, watch a leopard seal sunbathe between dives and enjoy an impromptu aerial show from passing Antarctic terns. With its spectacular landscapes composed of towering glacial peaks plunging down into the icy waters of the Antarctic, Paradise Bay is true to its name. Discovered and named by whalers in the early 20th century, this protected natural site is currently home to a wide variety of fauna, from Antarctic cormorants and leopard seals to sheathbills and gentoo penguins, who mingle on the long stretch of rocky beaches. With some luck, you'll even be privy to an unforgettable underwater dance between passing humpback whales. During your excursion, head off to discover the old Argentine base Almirante Brown, which is only occupied for a few weeks each year, during the austral summer. Itinerary is subject to ice and weather conditions. The expedition highlights described illustrate possible experiences only and cannot be guaranteed. • Visiting research stations and former whaling stations.